My name is Jatin, and I am working with a Pvt Firm in Delhi ( India ). I am blessed with a baby boy 4 months ago who was a healthy baby at the time of birth. After 3rd month he developed fever which lasted for more than 20 days on to which we got suspicious and after taking so many opinions we landed up in Sir Ganga Ram Hospital where they diagnosed the disease called SCID : Severe Combined Immuno Deficiency with CMV (cytomegalovirus infection) , one of the rarest disease which happens only to 1 of the 1 lakh babies. 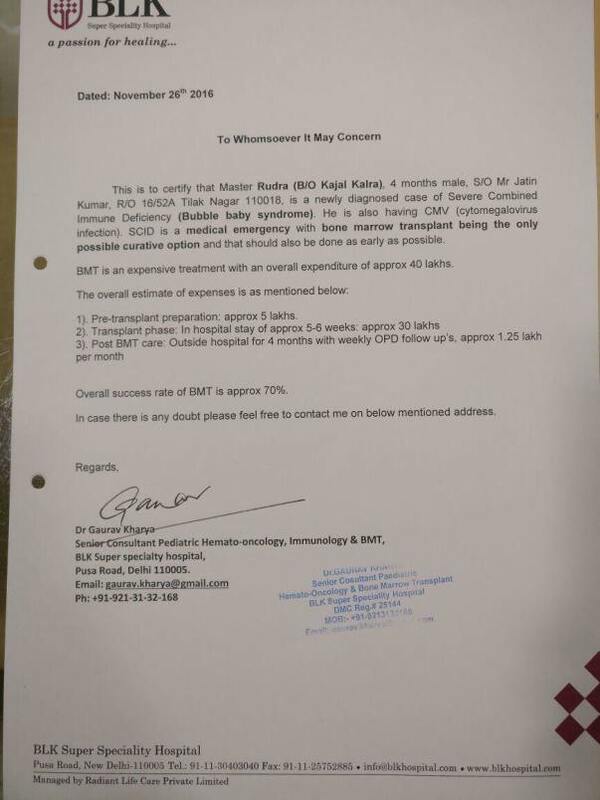 We have admitted him in BLK Hospital where the treatment cost is around INR 40 Lacs. Being in Service Class , managing the finances is becoming difficult for my family. We are trying our best to arrange the money for the treatment but 40 lakh is a humongous amount and we will be highly obliged with whatever amount you are able to support us . We have lot of dreams for our Rudra and this transplant will hopefully make us live most of them. With heavy heart i would like to update you all about the Sad Demise of my son RUDRA CHAUHAN aka AKKI - " MAN OF STEEL" who fought for 4 months against the inevitable. For these 4 Months life was at pause for me and my family , we saw Rudra crying , in pain , Fever (upto 104 F) , restless nights , heavy medicines and many more. In spite of that every second i and my wife use to convince each other that he will be alright. When parents were busy purchasing Crackers for their children on Diwali , when parents were busy buying Gifts on Christmas..... we were busy arranging injections and medicines from across the world. Just like any other Human being many at times we lost faith in GOD coz WHY US ??. We left no God Door's to knock. Temple , Church , Gurudwara , Masjid in Delhi , Punjab , Haryana. But later we realised that it is our Destiny to walk on this path. God gave us this problem which was pre decided but he gave us the support of all of you who supported RUDRA and my family so as to provide best of the treatment to him be it in terms of Monetary support or Best Wishes. I realised the Karma that we are living in a world where people do not give even single penny to a stranger and RUDRA got Lacs of Rupees in help. 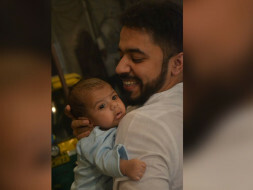 Now we are happy that RUDRA is in Safe hands of GOD ( Bhole Nath ) who will heal him and send him back again to his mother ( Kajal Kalra ) to live a healthy life. Thank you all for your support and Wishes and may god give you all the happiness and peace in life. Thank you for supporting us so far! To update you on the current status of Rudra's case , please be informed that the surgery has been postponed to 1st week of Jan'17 as CMV infection could not be brought down to the required level which is Less than 150 Copies where as it was 11500 Copies till last Thursday. However Dr. are expecting a reduction this week and will process the surgery even it comes under 1000 Copies. We have kept our fingers crossed so that by 22nd Dec'16 it should come under control. Posting another update on the progress of the treatment. We have got our HLA test report from Unites States and unfortunately none of our HLA matches 10/10 ( Mine 6/10 , My wife's 5/10 ). Doctors have checked with International Donor Registry as well to find a perfect match but could not. They shall be transplanting Mother's Bone Marrow ( My Wife's ) and have finalised the date 19th Dec'16 for the same. Keeping in mind the sensitivity of the surgery we have kept our fingers crossed and this is the only hope left with us. Through all your continuous support we have managed to reach near to our target and we request you to pray to GOD so that treatment goes successful. Once again my whole Family Thanks you all for your tremendous support in the bad time of our life.